Some nice promotions for premium transcon travelers in New York! Delta, obviously trying to gain market share in the “premium” New York transcon market, is offering paid business class passengers (J/C/D/S/I) between New York and Los Angeles/San Francisco 50,000 miles per roundtrip, while they’re offering those traveling in premium economy classes (Y/B/M) 25,000 miles per roundtrip. Registration is required and this is for tickets booked and traveled between April 1 and June 30. While it’s not worth trying to book a mileage run to take advantage of this, it is a very generous promotion. American is offering a similar promotion for trips taken between April 6 and June 30. 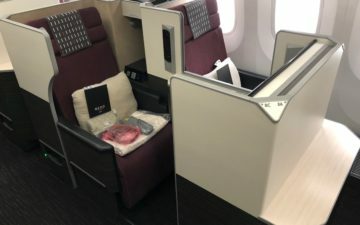 On American paid first class (F) and full fare fare business class (J) tickets qualify for the 50,000 mile bonus, while discounted business class (D/I) and full fare coach (Y) qualify for the 25,000 mile bonus. Registration using code TRNSN is required.